Thank you nookfield. That is EXACTLY the layout I was talking about. Transporter Room, lock onto the co-ordinates of one of the Beattie Well Tanks and beam it directly to Trepol Bay. Energise. 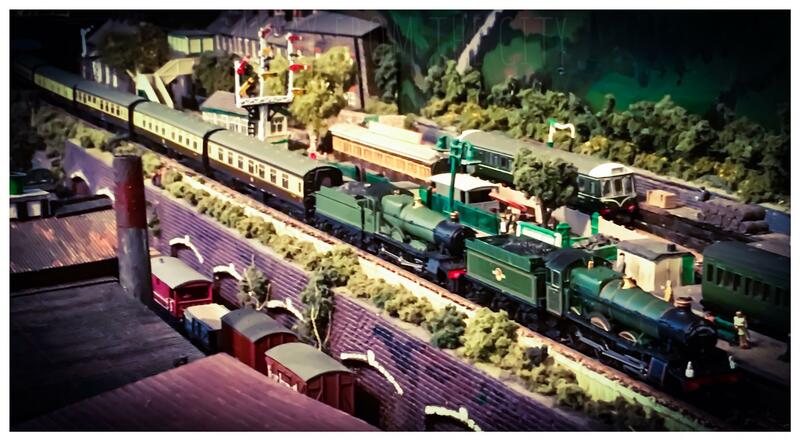 There is another 2mm finescale layout hat depicts Bodmin North (I think?) that also utilises scratch built Beatties. 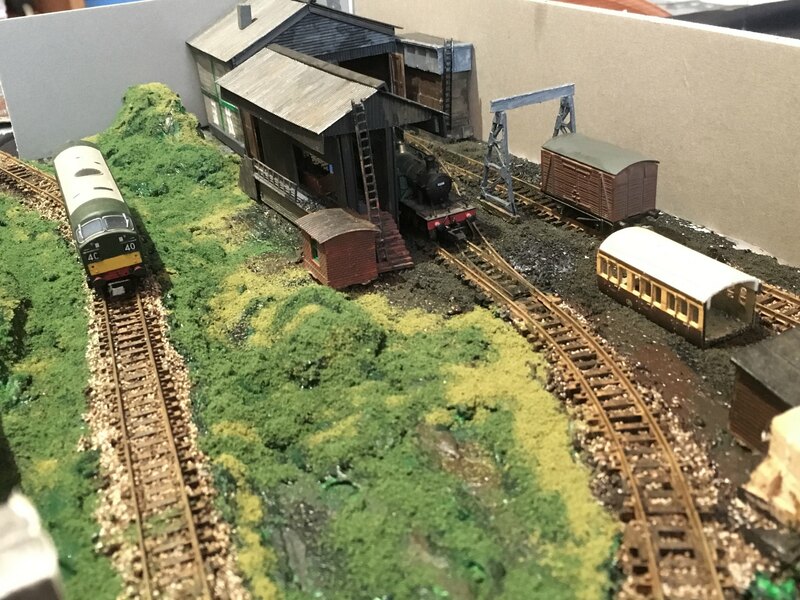 Bearing in mind the 'location' of your layout and the sheer appropriateness of these locos, do you ever feel tempted to give it a go? Surely, you have many contacts in the exhibition world and on here - might someone be commissioned? I am not trying to encourage you to blow a wad of cash, just thinking aloud. Thanks for that link. 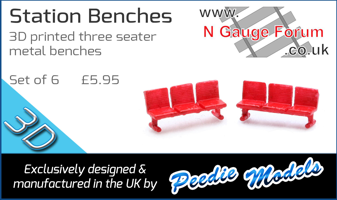 It is an excellent layout, especially as everything seems to be hand built. Much as I’d love a Beattie it is something that is definitely not in my skill set. I know that I could have a go but to be successful, I’d need to be interested and I know that I haven’t got an interest in that side of the hobby I’m afraid. One day maybe, I might have a think about commissioning someone to do it for me. Cracking stuff Martin, looking forward to seeing how this progresses, will probably be all done by the time I get home from work by valentines day! Today I’ve been doing more work on the coaling platform plus I’ve roughly knocked together the low relief water tower. The locohoist is simply two frames and a piece of plasticard girder blutacked together for now to gauge how it might look. I think though that this position will be ok for it in the long run. Sorry, the white edge of the boxfile makes it difficult to pick out the white girder (should have painted it). 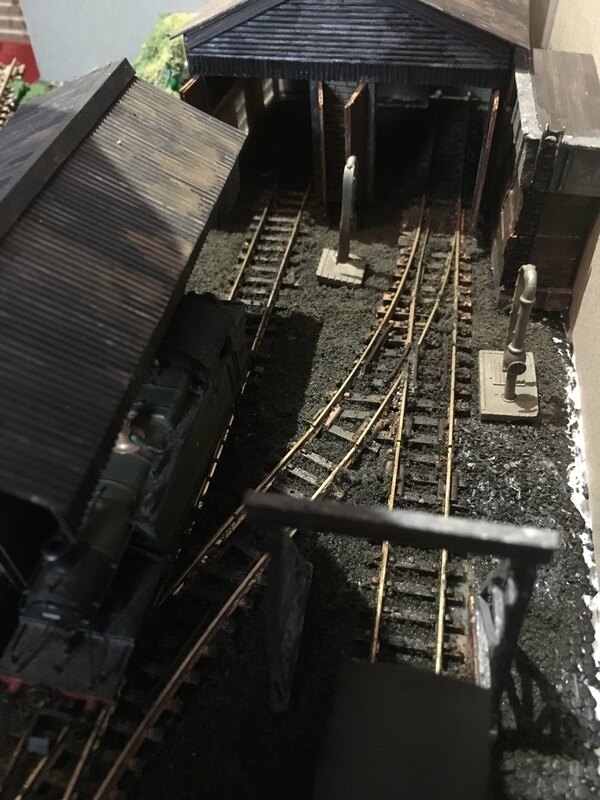 I think it’ll all start to look better once the landscaping is done and I’ve added the soot and clinker between the rails and around the yard. I also have the conundrum of how to tackle the backscene to think about. This morning, I’ve added the scatter material to the grassy areas in box 1 prior to adding static grass. 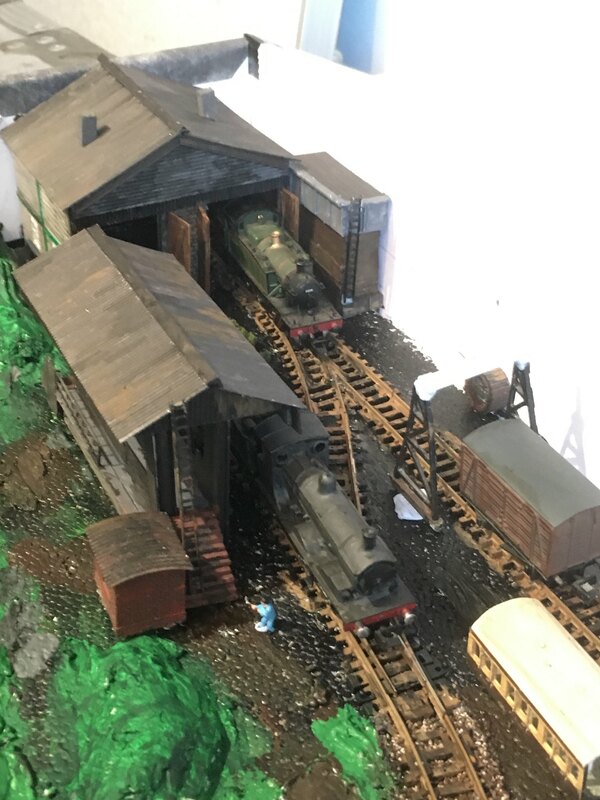 I’ve also added the sooty scatter around the shed yard. Note that some small areas have still to be tackled. The buildings etc are as yet uncompleted so are not firmly planted into place but this gives an idea of how the shed area will look. Still a fair bit to do yet though. I’ve now added some of the static grass although I do still need to sweep up in places to get rid of some overspill. I think the grass greatly improves things. I’ve placed the little wall pieces loosely as I can’t decide between wall and fencing so I think I’ll leave it for a bit before settling on a final choice. I’m also thinking about the backscene which will, in such a small space, be vital in bringing the scene to life. I have a few ideas so will play around to see what works best. 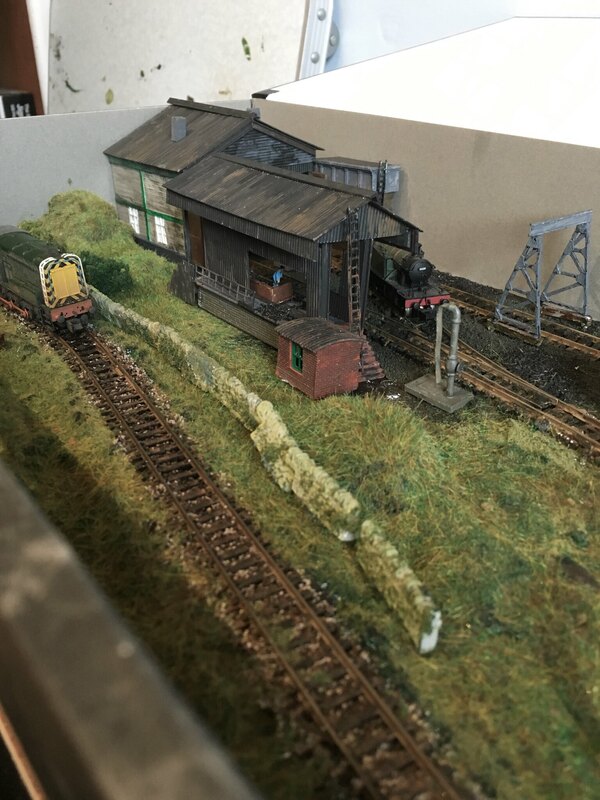 The depot is, I think, starting to look reasonable but a bit more detail and weathering is needed. Little items such as the LSWR water column (there’s another not in view) add to the feel and I have a bit of clutter such as oil drums to add later. That is looking pretty good and the wall looks like it belongs. Obviously haven't seen the potential fence but I like the wall idea a lot. As dannyboy says it looks like it belongs. Once again, please slow down. Great stuff and good luck on Saturday, hope you're not snowed off.